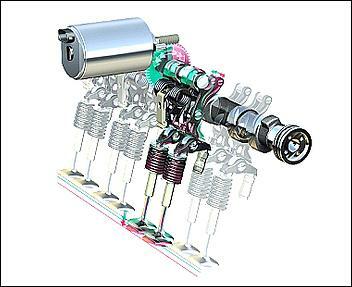 The first petrol engine without a throttle butterfly? Engines with variable valve timing are now commonplace: if a manufacturer these days isn't using a VVTi-like system, their engines are technically backward. 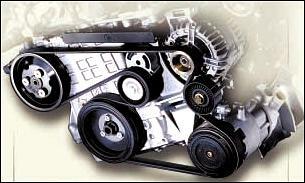 Even economy cars now feature variable timing of at least one camshaft, while variable cam timing applied to both cams is becoming more common. Add in systems that mechanically alter valve timing and lift in one step (eg Honda's now famous V-TEC) and the area looks all wrapped up. But there is now a new player on the block - an engine which can steplessly alter both the timing of each camshaft and also the lift of the inlet valves. And the key word here is 'steplessly', for that aspect opens up a whole lot of new possibilities. Featured in the brand new BMW 3-series, the 1.8-litre Valvetronic engine (the first of a new family of Valvetronic designs) mixes both unusual mechanical construction with the sensational new roller bearing valve control system. Being built at the British BMW engine plant, the four-cylinder develops 85kW and 180Nm of torque - that's 20 per cent more power than the previous model and comes with an amazing 15 per cent improvement in fuel economy - the pictured 316ti achieves 6.9 litres/100 km on the EC combined fuel economy cycle. The emissions performance of the engine is also excellent, without even the need for low-sulphur fuels. The most radical aspect of the new system is that no throttle butterfly is used. 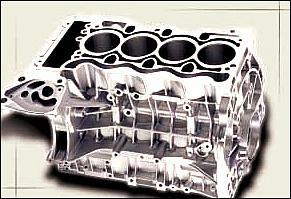 Instead, the engine changes its volumetric efficiency by altering the amount of intake valve lift. Theodore Melcher, BMW Project Manager, Four Cylinder Engines, draws the parallel with the human respiratory system. "Whenever we are required to make a greater effort," he says, "human beings breathe with a deep and long process of ventilation. Whenever we need less air, we do not throttle the supply of air by, say, closing our nose or our mouth, but [instead] simply breathe in a shorter, flatter process of ventilation." 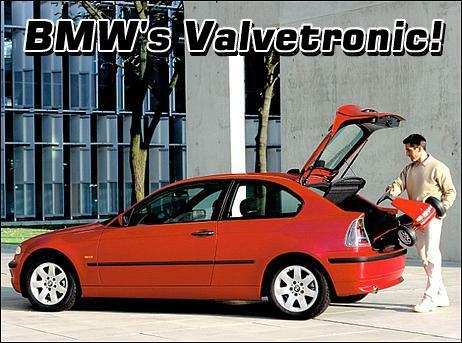 The Valvetronic system is based on BMW's established double VANOS system, which steplessly varies the timing of both the inlet and exhaust cams. However, the Valvetronic system adds variable valve lift to the inlet cam, achieved by the use of a lever positioned between the camshaft and the inlet valves. An additional eccentric shaft alters the lever's distance from the camshaft, with the eccentric's position determined by a worm drive from an electric motor. 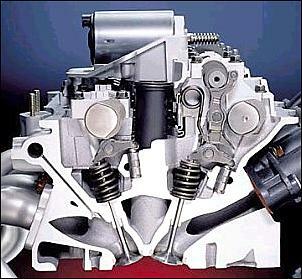 The position of the lever converts the cam action into a smaller or larger valve lift, as requested by the engine management system. Intake vale lift can be altered from a minimum of 0.25mm(!) to a maximum of 9.7mm, with the electric motor adjusting the eccentric shaft in 0.3 seconds. So instead of a throttle blade being used to restrict the airflow into the engine, the intake valve lift is decreased. Conversely, when more engine power is required, the intake valve lift is increased. This is said to give very fast response: there is no lag while the airflow fills the plenum chamber and cylinder runners. 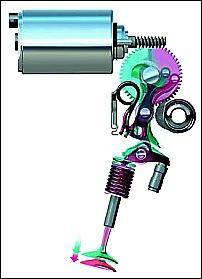 It is suggested that in this regard, the Valvetronic engine even outperforms multiple throttle butterflies. 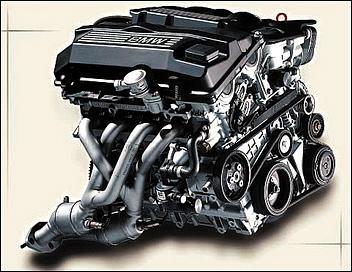 In addition to the Valvetronic mechanism, the new engine features many other innovations. The block uses an open-deck crankcase with crossflow head cooling channels that reduce the resistance to coolant flow, allowing the use of a smaller water pump. 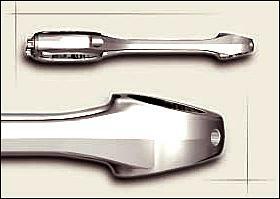 This decreases the parasitic loss of driving the pump by 60 per cent while lowering typical maximum temperatures by 60 degrees C.
The aluminium block is also surprisingly short - it extends downwards only as far as the centreline of the crankshaft. A major casting is bolted to the base of the block - it contains the lower halves of the crankshaft bearings, the balance shaft housing and two-stage oil pump. All ancillaries are bolted directly to the engine without brackets, reducing vibration. Unfortunately, at this stage only sketchy details of the engine are available in English - but as can be seen from the pictures, the unusual aspects of the engine aren't limited to just its valvetrain!